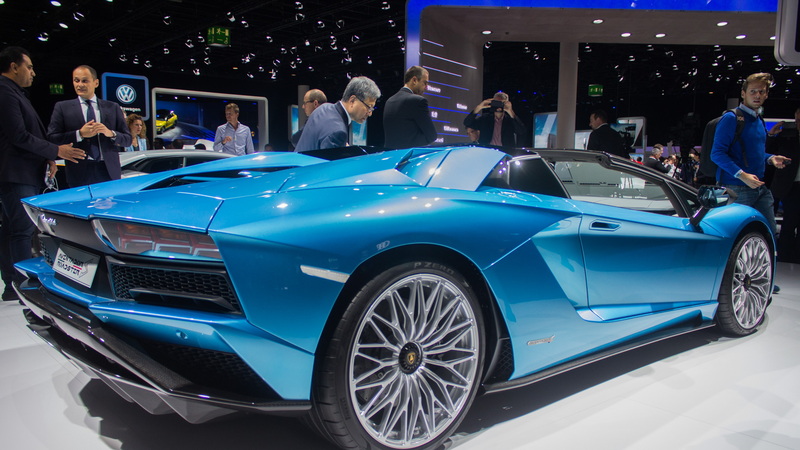 Like a fine wine, the Lamborghini Aventador only gets better with time. It is Italian after all. First, the coupe got the S treatment, and now it's the Roadster's turn. 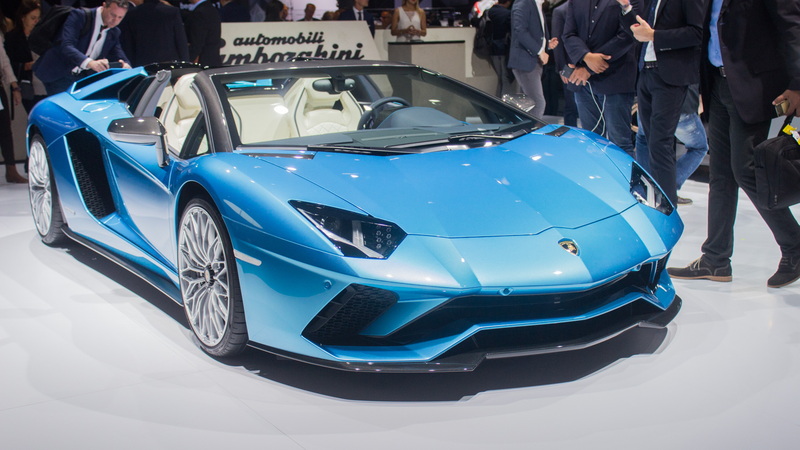 At this week's 2017 Frankfurt Motor Show, Lamborghini unveiled the 2018 Aventador S Roadster. The S suffix is the key here, and it denotes improvements to several areas of the car, including power, dynamics, aerodynamics, connectivity, and the ability to customize the way it drives. The 6.5-liter V-12 carries over but horsepower increases from 691 to 730 and the redline bumps up from 8,350 to 8,500 rpm. Torque remains the same at 509 pound-feet, but the torque curve is flatter. Lambo's somewhat frustrating Independent Shifting Rod 7-speed single-clutch automated manual transmission carries over, though with the programming updates from the Aventador S coupe. At about 110 pounds heavier than the coupe, the 0-60 mph time is 0.1 second slower, but at a still-blistering 3.0 seconds. 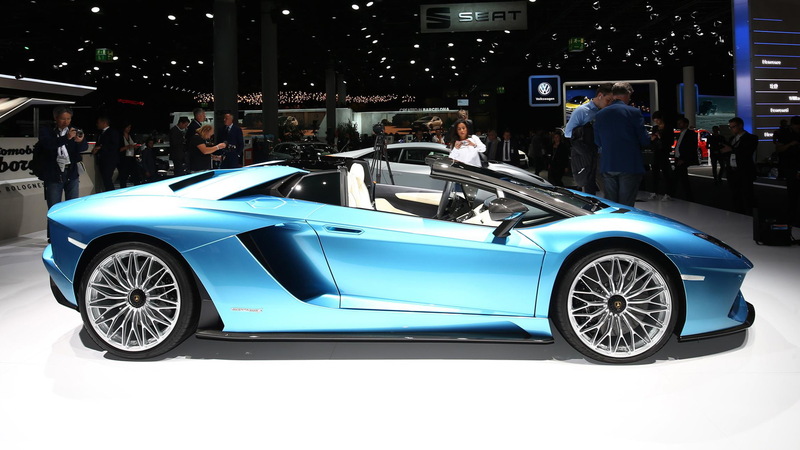 The Aventador S Roadster gains rear-wheel steering which can virtually shorten the wheelbase as lower speeds for agility and lengthen it at higher speeds for stability. All four inboard corners receive Lamborghini Magneto-rheological Suspension to push back on terra firma, while the outboard corners get Pirelli P Zero tires developed for the car; they mount on 20-inch (front) and 21-inch (rear) Dione wheels. All-wheel drive is also standard. Also adopted from the coupe is the new Ego driving mode. It allows drivers to choose among Strada (street), Sport, and Corsa (track) modes individually for the engine, transmission, all-wheel-drive system, steering, and suspension. Aero is another major component of the Aventador's shift to S. Like the coupe, the Aventador S Roadster gets a new three-position rear spoiler that both improves downforce when up and reduces drag when down. Changes to the front end improve front downforce by 130 percent, just like the coupe. However, the rear end and top have different lines than the coupe, and that gives the open car its own aerodynamic character. An engine bridge runs vertically to the rear of the body and buyers can choose either carbon fiber or transparent elements, the latter to show the V-12 lurking underneath. The top has a pair of removable hardtop panels that weigh about 13 pounds each. 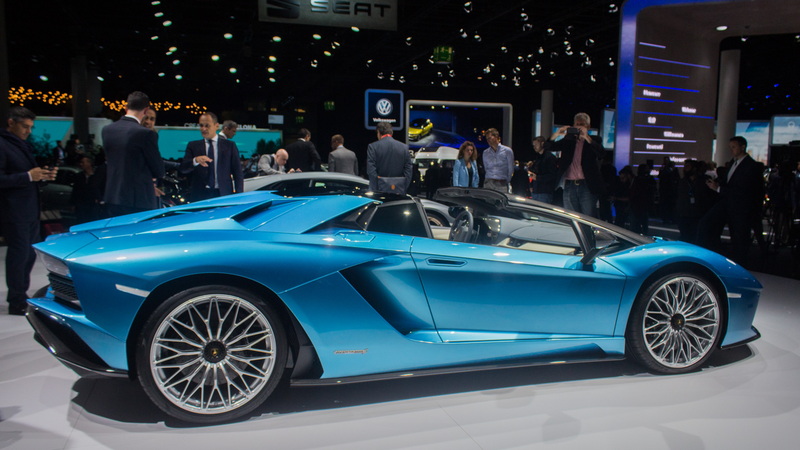 These can be ordered in matte or gloss carbon fiber, high-gloss black, and a variety of other colors through Lamborghini's Ad Personam program, and they can fit in the front trunk. There is also an electrically operated rear window that you can use to let in the sound of that glorious V-12. 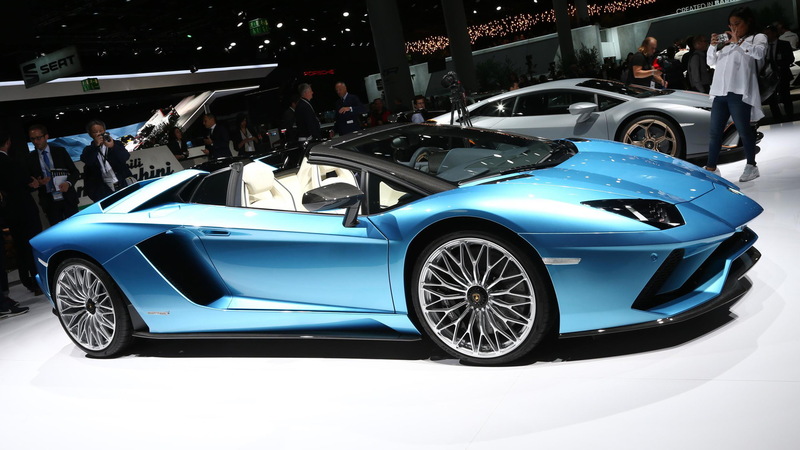 Other exterior features of the Blu Aegir car Lamborghini showed included high-gloss carbon fiber for the wing mirrors and windscreen frame, and visible carbon fiber along the lower portions of the car, including the front and rear bumpers, side skirts, air intakes, and air outlets. Inside, the Roadster adds Apple CarPlay and features leather and Alcantara upholstery in single- or two-tone hues. The Aventador S Roadster goes on sale elsewhere in February, though Lamborghini hasn't set a release date for our shores. Pricing will start at $460,247 in the U.S. Start saving now. For more from Frankfurt, see our dedicated hub.